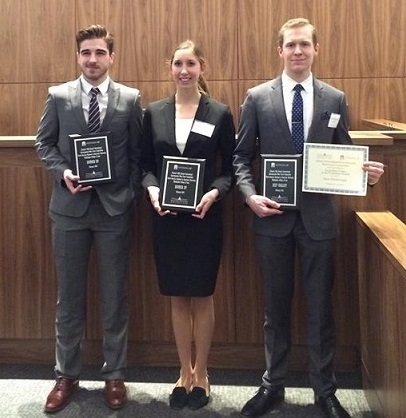 Our congratulations go out to the Pace 2016 International Environmental Moot Court Competition team that placed as a top 2 finalist in the North American Regional Round, February 19-21 in Washington D.C. The team will advance to compete in the International Rounds in Gulfport, Florida this April 13-16! The competition is hosted annually by Stetson University College of Law. This year’s competition problem involved a dispute submitted before the International Court of Justice, concerning the illegal trafficking of cultural property. Conor Strong (2L), James Patrick Logan (2L) and Leigh Wellington (2L) proudly represented Pace Law School at the competition. The team was under the direction of Cassandra Castellano (3L). During Saturday’s three preliminary rounds, Pace won 2 out of 3 arguments and advanced to Sunday’s semi-final round, where they won against the number one ranked team of the competition. The team then advanced to Sunday’s final round, where they placed as top 2 finalist of the North American Regional Round, and will advance to the International Rounds this April! 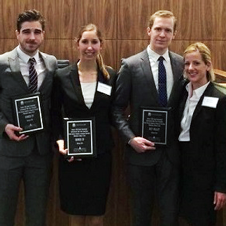 The team was honored to represent Pace Law School and bring home three awards. Patrick Logan (2L) received an award for 2nd place oralist of the preliminary rounds, and another award for best oralist of the final round. Congratulations Conor, Patrick and Leigh on their outstanding performance. We are excited to see them compete against the top teams of the world during the international rounds! Previous Congratulations to the Pace 2016 John L. Costello National Criminal Law Trial Team!